Korg's premier tuner has been newly redesigned, and is loaded with useful features. 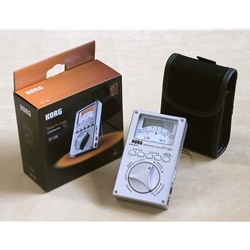 The dual readout has both VU-meter and LCD screen and a backlight for maximum visibility. The pitch detection range is A0-C8 and it can sound 5 octaves (C2-B5) at two volume levels. Its broad calibration range (349-499 Hz) and 8 pre-programmed historical temperaments (Pythagorean, Werckmeister III, Vallotti, Mean Tone Eb, Kirnberger III, Young, Mean Tone D#, Kellner) and 12 equal-tempered transpositions make it ideal for viol consorts and harpsichordists. Uses 2 AA batteries or AC adaptor (sold separately).